Coney Island Phase I is a 446-unit mixed-use project located in the Coney Island neighborhood in Brooklyn, New York. It will be developed by BFC Partners, L+M Development Partners Inc. and Taconic Investment Partners and constructed by L+M Builders Group LLC. The Project consists of two 16-story towers above a 7-story podium and will measure approximately 521,000 gross square feet. It will include approximately 96 accessory residential and commercial covered parking spaces on grade on the ground floor along with approximately 15,000 gross square feet of dry flood proofed retail space, and approximately 66,000 gross square feet of new office space for the New York City Human Resources Administration (HRA). 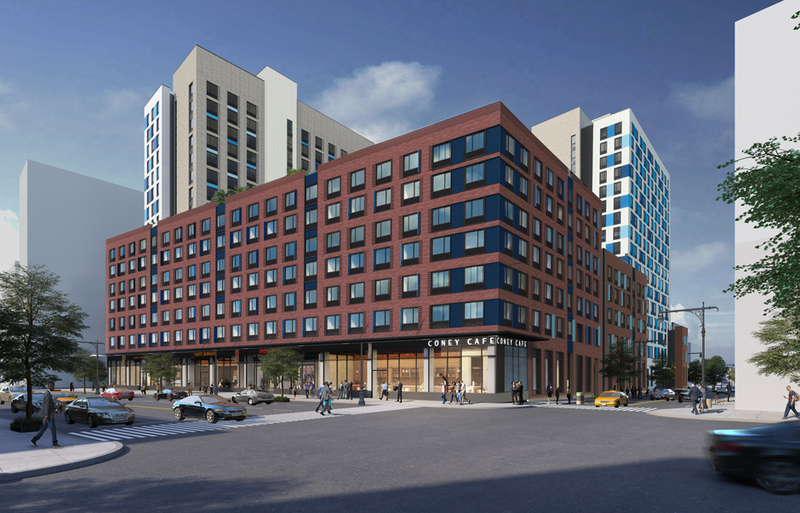 The project will include 446 rental apartments located on the second through the sixteenth floors affordable to households whose income does not exceed 100% of Area Median Income (AMI) and two landscaped decks on the 8th floor for passive recreational use. The Project will be constructed as a concrete podium with block and plank on floors 2-16 and will employ distinctive material and color combinations to reflect the palette of its beachfront location and fit within the context of the greater Coney Island district. The site is conveniently located 0.4 miles from the Coney Island Stillwell Avenue Q train station, across the street from the Brooklyn Cyclones at MCU Park and 0.3 miles from the historic Coney Island boardwalk and beach. Handel Architects’ Coney Island project listed in top 10. L+M’s Coney Island project ranks 5th. Designed to be resilient against future storms, phase one development will provide affordable apartments, retail space, and a new home for HRA. The first phase of development will deliver 446 fully-affordable apartments. Project's first phase includes 446 units for formerly homeless, very low- low- & moderate-income families along Surf Avenue.